We PC gamers have it hard when it comes to 3D platforming games. A genre that flourished in the late ’90s, early ’00s on consoles seemed that it never found its way properly on our computers. Thankfully, Gears for Breakfast came to change that, presenting us A Hat in Time, a game that feels like a tribute to those beloved 3D platforming games. The story of A Hat in Time is very simple. Our cute Hat Kid is flying with her spaceship on her way home, until at some point, a Mafia Cook knocks her spaceship window demanding a toll. She refuses, he breaks the window and because of the decompression she loses all her Time Pieces, the fuel to her ship. Now she needs to visit the different areas of the planet in order to collect all forty of them and be on her way home. Very simple as stories go, but that isn’t the point when we are talking about 3D platformers. The story is there just to give you a sense of direction, pointers of where to go and what is left to do next. 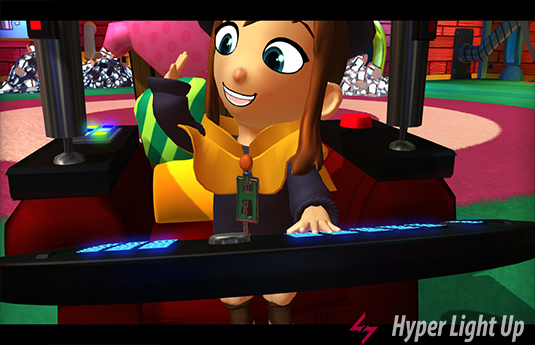 The real strength of A Hat in Time is its mechanics. I am a gamer who lived in the N64 and Playstation 1 era, where 3D platformers were all the rage. In the early ‘00s I turned my focus only on PC and for me there weren’t a lot of games that could scratch that itch on that platform. So the time passed, I forgot about the genre and the only times I would be reminded of it was when I watched speedrunners doing crazy stuff with Mario 64 and Zelda : Ocarina of TIme on YouTube. With the rise of indie gaming we saw a lot of 2D platformers that were amazing, so it felt that the time was coming for 3D platformers to rise too. It seemed that the developers Gears for Breakfast and more than nine thousand backers had the same 3D platforming itch, because A Hat in Time was successfully funded on Kickstarter, reaching nearly ten times its goal. Now we have the game in our hands and let me tell you, this is exactly what I wanted on PC. If you’ve played a lot of 3D platformers before then you know that the controller becomes a part of you, that the mechanics of the game stay in your mind because of repetition and the need for accuracy. A Hat in Time begins in the bedroom of the Hat Kid, the moment she wakes up. Immediately, I started performing jumps and dashes, moving around and testing the camera with the controller sticks. 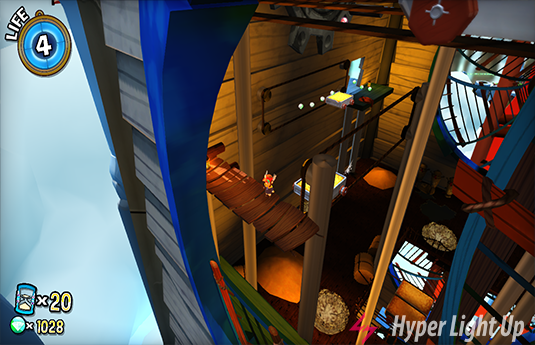 The mechanics of the game take notes from all the great platformers before it and are implemented in such a wonderful way that It felt like I had played A Hat in Time before. I didn’t need to learn new mechanics or take some time practicing in order to progress. The moment the game started I was good to go, and the only challenge would come from my actual skill in platformers in general. This should be viewed as a high praise to the developers. We as gamers have our preferences in games and we choose the ones that feel familiar to the way we like to play. Think about FPS, Adventure or RPG games. From game to game the mechanics do not change much. For example, you know already how to run and aim in a FPS, you know how to look and pick up objects in an Adventure and you know how a character levels in an RPG. What usually changes and makes the games different for better or worst, is the implementation of these mechanics. A Hat in Time gives the gamer exactly that familiarity from the get go. There isn’t a chance that you like 3D platformers and you won’t love the game’s mechanics. You have your jump, doulbe jump and dash, which can be performed on the ground and in the air. You can cancel dash at any time, a move that helps with accuracy and is required in all stages. It is a move that corrects mistaken calculations, for example how far is a platform in reality instead of what you thought in your mind. More moves include wall climbing for a few steps and if you reach two opposing walls, you can combine wall climbing with jump to reach higher places. You have the ability to hit enemies with an umbrella or jump over them and hit them. In my playthrough I rarely actually stayed and hit enemies. To tell you the truth, I would have forgotten that I have a weapon in my hand if it wasn’t for the boss fights. In A Hat in Time you can reach your goal without the need of hitting all the enemies. Just find the fastest platforming line, combine all the above mechanics and you are good to go. You can also grapple on specific points in order to swing around, reaching for otherwise unreachable platforms. 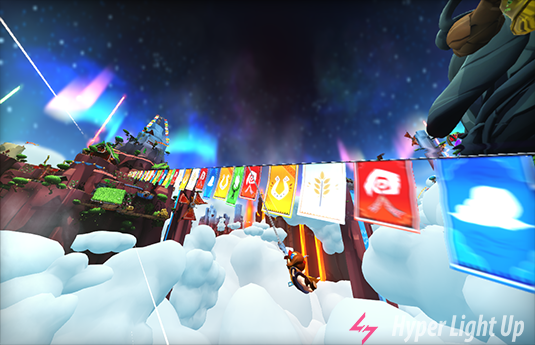 As far as goals go, in A Hat in Time the stages are filled with green and red pons. The former are the currency of the game that lets you buy various stuff, like pins to hold badges and help you unlock some stages. The latter simply fill your health bars. You can go nuts, explore every stage and collect everything if you like. It is not needed for the progression so don’t worry about grinding. With green pons you can buy badges from a pretty creepy salesman that give you some extra abilities, like showing a map with the collectibles of the area or killing you with one hit, if you want to up the challenge of the game. The other important collectible is yarn, that lets you saw new hats with different abilities. You can saw hats that make you run faster, that let you see in other dimensions or let you create an explosive mix. You will need some of these hats to progress in later stages but there is also one that I didn’t need to complete the game. I didn’t even need to saw it, which seemed like a missed opportunity. It feels like every stage is created with care to cater to our platforming needs. There isn’t a moment that I felt stuck or frustrated. Throughout my playthrough, every time I made a mistake, it was because of my calculations and skill, and not because of the game. In truth, every stage feels like a playground, you go in, jump around and explore, trying to perform moves to reach places in different ways. The game was designed with speedrunning in mind and as the developers told us, there was already a speedrunning community forming, since the Beta version of the game. The difficulty progresson feels good too. The game asks you to perform simple moves in the beginnig and as you go from stage to stage, there are more complicated moves to perform, that need more accuracy. The only difficulty spikes I encountered were during boss fights. I mentioned before that the stages feel like a playground and as such, a new gamer to this genre can go in, learn the mechanics and have a good time. There are some bosses though that made me feel that if A Hat in Time was the first 3D platformer of a gamer, they would have a hard time beating them. Thankfully, there are a lot of things to do and a lot of stages to play before the need to go into a boss fight, so someone can take their time and begin the fight when they feel ready. As far as this strange world goes, it is totally charming. There is a variety in the stages you can visit, filled with interesting and cute characters and enemies. You will be asked to solve a murder in a train, collecting clues about who did it, you will have to parade in a stage in order for your fans to see you and take a picture of you, you will visit a spooky forest where you will lose your soul and you will have to complete contracts to get it back. The game becomes surreal at times, asking you to save a dog made of cardboard, which really made me laugh. The orchestral music accompanies this bright and beautiful world in the best possible way. It brings in mind all the best platforming soundtracks with its playful melodies and changing feel depending on the situation, having creepy and horror undertones in the forest or a film noir jazzy feel while you investigate the crime in the train. A couple of my favorite music pieces are the Cave Rave, with its bright, uplifting chords and funky bassline, a song that I could easily encounter in a Todd Terje album, and Clock Towers (Beneath the Sea), with its mysteriously beautiful ambient sound and melody that feels like it jumped out of the soundtrack from Final Fantasy X. Just take a listen below and you’ll know what I mean. 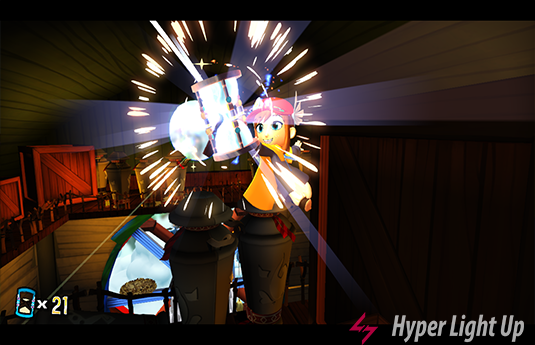 I knew the game was special since our Hyper Light Up director, Kelfecil, was lost in the demo of A Hat in Time while I was talking with the developers at Gamescom 2017. He was focused on the game for twenty minutes, without taking his eyes from the screen or even speaking to comment on design or mechanics. When he finally finished, he had gathered every collectible on the stage and I knew that he loved every moment of it. I got to finally do the review because of time availlability. The great thing was that I would come back from work, fire up the game and actually chill, tackling stages on my own pace, sometimes just exploring, collecting and enjoying the mechanics, other times progressing through them and facing bosses. It is a game that I was itching to play, that invited me to double click on the icon, because I was having a great time. It took me ten hours to finish, collecting twenty six time pieces and completing just 64% of what can be done in the game. A Hat in Time comes at half the price of a AAA game and totally worths every penny. A Hat in Time hits all the right points for its genre and offers a great experience. If I had to find faults, those would have to do with the boss difficulty spike, the simple story and the arch enemy, Mustache Girl. In the game she is the character that you have to outrun in gathering the time pieces, she is presented like your biggest adversary. After some time though, I forgot she was into the game. Every stage has its own theme and the characters you meet don’t even mention Mustache Girl, it feels like she doesn’t exist there. This is nitpicking in the actual meaning of the world since it doesn’t really matter and doesn’t take away from the overall experience. You can buy A Hat in Time on Steam for the price of 27,99€. A Hat in Time is the game every 3D platformer fan wanted in their lives. Quality games like this are pretty rare on PC. With its platforming mechanics on point, a bright colourful and charming world filled with collectibles and places to explore, cute characters, amazing music and awesome, even though a bit hard, boss fights, this is a must own game. A Hat in Time should be in every Steam library, it is that good and I can see everyone enjoying it, if they give it a chance.